Do you need Christmas diet tips that will help you stay on plan and healthy through the holiday season? 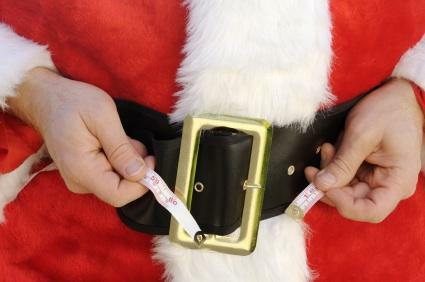 Although it may seem inevitable, there is no reason why you should gain weight over the holidays. As a matter of fact, it is possible to lose weight over the holidays by following Christmas diet tips that can help you to stay on track. It's no secret that the holidays can derail even the most carefully planned diet. Temptation is everywhere - from the bowl of candy on your co-worker's desk to the gigantic Christmas dinner that your mother-in-law cooks up every year. With all of this temptation, what's a dieter to do? How can you keep from having your diet not only derailed but possibly destroyed by holiday festivities? These Christmas diet tips can help you avoid derailment and side-step temptation so that you can have a healthy and happy holiday season. Christmas doesn't have to throw you off track. There are a number of things that you can do to satisfy your cravings and still have a weight gain-free holiday. 'Tis the season for Christmas shopping. Embrace going to the mall and be sure you walk from one end to the other. Not only that, but you'll probably not find a parking space close to the mall. If you do - don't take it. Instead park as far away as you can and walk. Be sure you carry your packages with you. All of that added exercise can help to burn calories during the holiday season. Host your own party. Its inevitable that you will be invited to parties at Christmas, and everyone knows what kind of treats find their way onto the table at such parties. Why not take the bull by the horns and host your own party? That way you can control the foods that are offered. If you do go to another's Christmas party, offer to bring something, and then bring a healthy Christmas snack that will tempt you. Limit alcohol consumption. Alcohol in and of itself isn't necessarily fattening. It has seven calories per gram (as opposed to four calories per gram in carbohydrates and proteins and nine calories per gram in fats). Alcohol, however, is metabolized differently in your body than other macronutrients. Alcohol is always metabolized ahead of anything else that you eat, so it can put your diet on hold. If you do have an alcoholic beverage, stick to simple drinks without a lot of sugar or heavy ingredients. A glass of dry wine or a spirit served neat or on ice are better bets than eggnog, which is loaded with sugar, fat, calories and alcohol. Control your portion sizes. If you simply can't pass up that piece of fudge, then have just a small square. Make smart substitutions. If you're still craving that fudge, you may wish to satisfy that fudge craving with a small square of dark chocolate, which is rich in antioxidants and lower in sugar and fat than a square of fudge. Don't shop hungry. It may be an old axiom, but it is a good one. If you go to the grocery store hungry, you are far more likely to cave in to temptation and bring home foods that will tempt you to go astray. Even the best laid diet plans have been thrown off by a gingerbread cookie or a slice of pie. Eat a healthy snack before you go shopping and shop with a list. Don't keep temptations around the house. It's difficult enough navigating the office and the parties, but if every time you open the refrigerator you stare down a pumpkin pie, there's a good chance you'll crack. If you must have holiday treats in your house, try baking up some healthy holiday desserts and keeping those on hand. Be sure to get plenty of exercise. The holiday season can be busy and exhausting. Sometimes it just seems like you don't have the time or the energy to exercise. Ironically, one of the ways to fix flagging energy is by exercising. Don't skip on your regular exercise routine no matter how busy you are. Even if you only have 30 minutes, take those 30 minutes and get active. Walk around your neighborhood and look at Christmas lights. Go outside and build a snowman with the kids. It doesn't' have to be formal exercise, as long as you are moving. There is no need to allow the holidays to derail your diet. With a little planning and a few diet tips, you can stay on track all season.